Joie de Kitty: Go ahead. Laugh. I should start off this story by mentioning that everybody here has been commenting on how much taller I seem now than when I left to go to Switzerland. Finally I decided to have my mom measure me – just to see. Well, what do you know. I grew half an inch. So now I’m a solid 6’1”. A long time ago, my grandfather (on my dad’s side) took his car into the shop for repairs. He accidentally left some important papers inside, but the car was up on the pneumatic lift, so he had to climb up to get in it. He found what he was looking for and stepped out of the car… forgetting that it was still up on the lift. Also a long time ago, when my dad was in 5th or 6th grade, he decided to ride his bike home from school one day. Not too far from school, a big, mean dog started chasing him. Dad was pedaling that bike as fast as it would go, constantly checking over his shoulder to gauge the distance between his bike and the dog. Eventually the dog slowed down and stopped, giving up. Dad kept looking over his shoulder though, still pedaling like hell and reveling in the growing distance between the dog and himself. Until… WHAM! His bike crashed into a truck, throwing him clear over the vehicle onto the asphalt on the other side. Dad got up, brushed himself off, and went to collect his bike. Which would no longer roll. So he picked it up and carried it the rest of the (long) way home. His mother greeted him at the door with, “What happened to your bike? !” No mention whatsoever of how banged up he was! Anyway, tonight I made chicken tetrazinni for dinner. Mom wanted some, so I made up a microwave plate for her and went to take it to her. My grandmother was out smoking in the garage with the garage door up a foot for ventilation. I told her I’d see her later, hit the garage door button to make it go up, and attempted to walk out of the garage. The problem is that extra half an inch. I misjudged how high the garage door had gotten off the ground and ran smack into it. I hit it so hard that I fell down and the plate of food went flying across the driveway. I sat there for a bit, trying to get my wits about me, then finally climbed up with the assistance of the car hood. Meanwhile, my grandmother was sitting in the garage, laughing her behind off at me. I scooped the spaghetti up out of the driveway (we have feral cats in the neighborhood, and I did not want a yowling kitty party on our doorstep overnight), went inside, filled another plate, then managed to exit the garage successfully to drive over to my mom’s house. 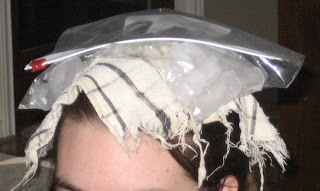 When I got to her house, Mom attentively created an ice pack for me and placed it on my head. Then she burst into uncontrollable giggles. My stepdad came in, saw the state of my ice pack, and began teasing me relentlessly. I called my dad, hoping for a little more sympathy, and he laughed so hard that he couldn’t breathe. So go ahead. Laugh. I can handle it. ummm, ouch. Hope you don't have too big a knot. Oh, and don't feel bad. I'm 5'3 and clumsy as can be. I bang into stuff all the time. It's even funnier when I put on the tall white toque (13"). That makes me a foot taller. I cannot count how many times I've smacked someone in the head with my hat cause I forget about my added inches.